In April of 2010, my family met up at Walt Disney World to celebrate my daughter's first birthday. My brother and I had been avid podcast listeners for a while but my dad had just gotten an iPad. Chris and I were suggesting shows we liked and the idea of our own podcast was kicked around. Once we returned home, I decided I just had to write about what I had learned. I had many questions prior to taking my daughter to the World for the first time. I really had to dig for many of the answers and still learned much of it the hard way. We lived far from family and I was already blogging about "Tink" so setting up an additional blog was quite easy. One rainy afternoon while the little girl napped, I began writing about my favorite place. We've each written our own bios and you can find them on "The Family Behind the Blog" page. Chris (AKA Ridge) has really done a fantastic job and I am thrilled to be working with him. We are very good friends and it's hard to live so far from home but this project helps. I've always thought he was smart and funny and he brings that to the blog in his writing. Check out a few of his articles on his page. Chris has also become quite good at photography. Especially on his recent solo trip, he's taken some impressive shots for the blog. His Flickr Photostream is always on the upper right column of the blog, so if you need a little escape, drop by and look through some of his photographs. From time to time, all three of us will answer one question. I keep those articles listed on the "Trip Planning" page. 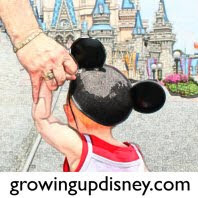 Sometimes we answer the questions we are asked all the time as frequent Disney guests. Other times we reminisce or dream. 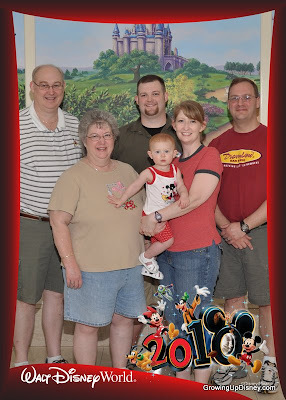 Each Wednesday, one of the three of us shares a photo from our family's nearly 40 years of WDW visits. As we celebrate the end of our first year, I thank these two wonderful men for working on this project with me and I look forward to making more Disney memories with them. Happy blogoversary! How wonderful that it's a family project! I <3 it!